Too many promising talents have seen their careers end on the surgeon's table. Don't be another cautionary tale! Take a proactive approach now to your self-care and training, and watch it pay off for years to come. Arm injuries in baseball have been on the rise in recent years, and it's proving difficult to pin down any single culprit. Of course, the repetitive, violent motion of throwing a baseball as hard as you can will always bring a risk of injury. But it doesn't have to be inevitable. 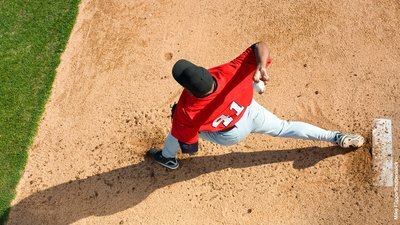 I have a unique perspective on the issue as a current baseball pitcher who's been through UCL reconstruction (aka "Tommy John" surgery) not once, but twice. I'm still pitching—pain-free—after my second operation. I also own Warbird Training Academy, a facility where we train a tremendous amount of baseball and softball players. Injury prevention is our first priority, and you'd better believe it takes some strategic programming to keep everyone healthy. No matter if you’re an aspiring pitcher, or a coach responsible for one, it’s essential to focus on strength and health along with performance. Here’s what you need to know about caring for the elbow and shoulder, as well as safe training and throwing guidelines to help beat the odds. The ulnar collateral ligament, or UCL, is a passive structure which can't be strengthened directly with exercise. The force produced in a pitch would tear the UCL instantly without the support of the muscles in the forearm that help reduce elbow stress. Thus, good preventive maintenance includes strengthening the hands and forearms. Though strong forearms are essential, it's a good idea to use conservative loads with exercises like the deadlift and farmer carries. Increasing a weak athlete's deadlift to, say, 315 pounds can definitely increase performance on the field. But deadlifting 600 pounds is probably not going to yield much additional benefit for a pitcher, while exposing the elbow to tremendous distraction forces. The risk vs. reward isn't there. Although I'm not aware of research showing negative effects of heavy holds, I tend to err on the side of caution and advise other baseball players to do the same. My short recommendation is to lift heavy enough to be strong, but not to the point where the risk of injury and joint stress becomes significant. Power Rack Wrist Rollers: Wrist rollers are a great way to build strength and endurance in the forearm flexors and extensors. I prefer propping a long pipe on a power rack so that the shoulders aren't the limiting factor. A "power rack wrist roller" can be cheaply made at home with just a pipe, flat webbing, and a drill. Simply drill the pipe, thread in the webbing, and attach a weight. Farmer Carries: For heavy holds, I advise athletes to use no more than 150 percent of bodyweight, in total. For a 200 pound athlete, this means no more than maybe 315 pounds on a trap bar or no more than 150 pound dumbbells per hand. Forearm Six-Way: This circuit covers the six main movements of the wrist: wrist flexion, extension, pronation, supination, ulnar deviation, and radial deviation. This provides great balance to the forearms and is foundational in rehabbing from a UCL or flexor injury. This can be performed with a flat band or with dumbbells. The throwing shoulder needs a combination of strength, endurance, mobility, and stability. Train for these different aspects by using a good mix of exercises from each category. Here are some of my favorites. No Money: The "no money" is simple and very effective for scapula retraction, depression, and external rotation strength. It gives great posture benefits, and is easy to perform for athletes of all ages. Perform 2-4 sets of 10-15 reps, 2-3 days per week. Moving Blackburn: Moving blackburns provide high time under tension, strengthen the scapulae in numerous directions of movement, and help teach scapular awareness. It's important to focus on squeezing the muscles and directing your shoulder blades into the proper position. It's not enough just to lift your arms into position. Perform 2-4 sets of 10-15 reps, 2-3 days per week. Chain YTL: The point of using the chains is to force the arm to stabilize as the chains slosh around. Perform 2-3 sets of 10-15 reps. Swing the chains up fast and hold them steady at the top. Throw more, with less effort. Almost all medical professionals and biomechanical experts blame game-speed, intense-effort throwing for the increased risk of arm injury. Ligaments and tendons have a finite amount of stretch, and throwing at maximum effort brings them near their breaking point on each throw. When arms fatigue from high pitch counts and overuse, reports of pain increase accordingly. Throwing is crucial to developing arm strength and mastering different pitches, but this can be achieved without max-effort throwing. Throw more in practice sessions and fewer innings in games. Experiment with long toss, bullpen sessions, and flat-ground sessions. Don't go low-carb. Glycogen, the form of sugar that is stored in the muscles for immediate energy, is an athlete's best friend. Arm fatigued? Your glycogen is depleted. Arm feels great? Your glycogen has had time to replenish. Low-carb diets can leave an athlete with chronically low levels of glycogen, which will result in decreased velocity and stamina. A healthy diet that includes ample carbohydrate content is crucial for high athletic performance. Though your favorite bodybuilder or fitness model may go low-carb, or cycle their carbs, athletes have to take a different road. It's not all about six-pack abs; it's about performance first. I can tell you that from my many years in baseball, my velocity and stamina on the mound are most consistent when my diet is consistent and my calories are high. Everyone's required calorie intake will vary, but carbohydrates should be present in all meals and plentiful during and after a game. Make sure your glycogen stores have ample nutrition to replenish and recover. Throw changeups instead of curveballs until sophomore year. To be successful, nearly all pitchers will need a changeup in collegiate and pro baseball. The only population of pitchers who don't throw a changeup are late-inning relievers who throw much harder than the norm. Most pitchers will never fit this mold, so it's ideal to practice the changeup at a time when curveballs are more risky: when kids are growing like weeds. Though biomechanically, curveballs are not more stressful than fastballs, one study indicates that there is a greater prevalence of arm pain in young pitchers who throw curveballs. If you don't throw a changeup, check out my video tutorial below. Take days off. Baseball is a sport of tradition, and tradition says to throw every day. Though throwing is crucial for long-term success, I recommend two days completely off each week. I'm entering my twentieth year as a baseball player, and my pitching skills have never disappeared overnight. Rather, the shoulder and forearm muscles recover faster with true rest, which will help ensure a pitcher is fresh for games. Focus harder on mechanics. If your throwing mechanics aren't as good as they need to be, focused practice is the only way to clean them up. Pause, set yourself, and focus on the perfect version of yourself before throwing. Less is more. When I have days off, I don't throw at all. Nothing whatsoever. Recovery is key to staying healthy. This season, as a reliever, I've taken one day off per week and have felt good. In the offseason, I make sure to take a solid 6-8 weeks off from throwing to let my body heal. Then, I slowly ramp up my throwing volume to prepare for spring training. Meter your throwing. Relievers like me throw in pregame nearly every day. We work on our pitches at a low-speed and try to "feel" all of them. I listen to my arm and meter the amount I throw. If I feel great and haven't pitched in a game, I'll stretch it out and throw more before the game. If I've pitched recently and don't feel overly fresh, I'll throw a little less. It sounds simple, but many guys throw too much when fatigued and it can accumulate, leading to injury and poor performance. Routine is crucial. Young pitchers can learn a lot from pitchers who have been hurt. Once injured, you learn to be more regimented and consistent in routine. You throw exactly as much as you need to be prepared for the game. You work harder on your whole body to be well-conditioned, strong, and flexible. You learn to focus harder so you get more out of each throw. The goal is to give your body exactly what it needs; nothing more, nothing less. Cheetahs only sprint when there is something to kill. Injured pitchers are the same way. Mechanics matter. Even as a pitcher who throws hard and has found success at a high level, my mechanics aren't perfect. And when they're off, my body feels it. My arm feels the best when my mechanics are well-timed and efficient. It always helps me to get input from coaches and other pitchers on my mechanics if my arm is hurting. There's often a mechanical tweak that provides relief. Employing a good plan to strengthen the elbow and shoulder, and ensure that the throwing arm isn't overworked will provide the best chance for a baseball player to stay healthy for a decades-long career. As an added benefit, good preventative care provides a performance boost as well, so those same exercises and strategies that keep the arm healthy will push the player's development to new heights. You've got nothing to lose by taking care of yourself, but everything to gain. Fortenbaugh, D., Fleisig, G. S., & Andrews, J. R. (2009). Baseball pitching biomechanics in relation to injury risk and performance. Sports Health, 1(4), 314-320. Yang, J., Mann, B. J., Guettler, J. H., Dugas, J. R., Irrgang, J. J., Fleisig, G. S., & Albright, J. P. (2014). Risk-prone pitching activities and injuries in youth baseball: findings from a national sample. The American Journal of Sports Medicine, 42(6), 1456-1463.